The Stillwaters Spa & Salon, located on the main level of the lodge, is unique in its presentation, luxurious style and warm, welcoming atmosphere. Complemented by the pure Rocky Mountain air and spectacular Teton Valley scenery, this 5,000 square foot facility features a full range of treatments and services. The seven spacious treatment rooms, including a two-person therapy suite with fireplace, were designed to insure all visitors to the Spa feel an instant sense of well-being the moment of arrival. 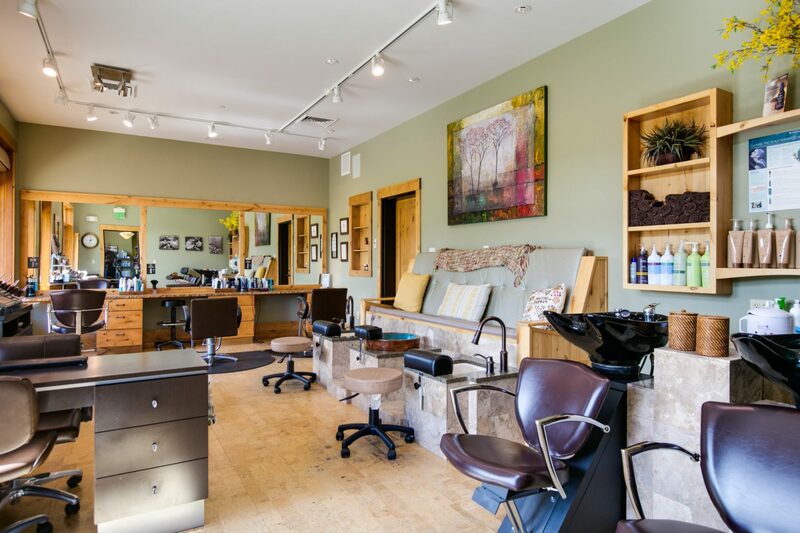 The Salon is a cheery place filled with natural light and complemented by views of the neighboring mountains. The salon boasts a team with deep experience in hair styling & color, eyelash extensions and make-up application and the mani/pedi technicians are also considered by many to be the best in the valley. 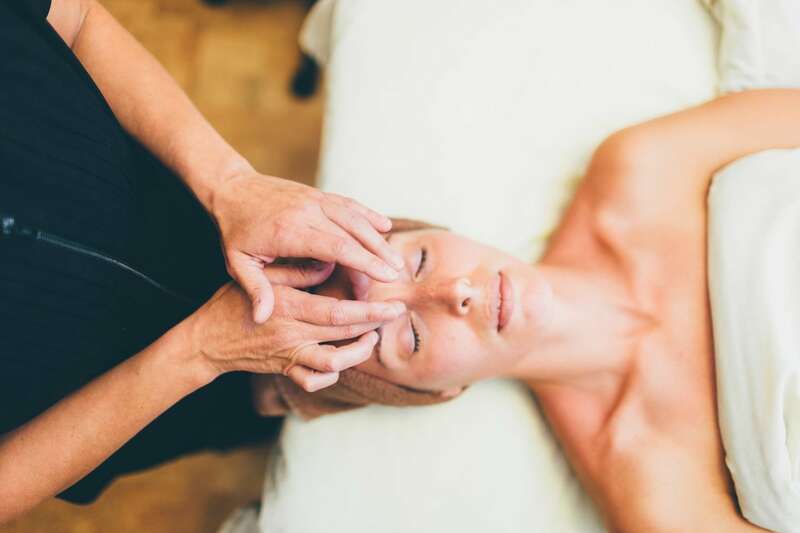 The same can be said of the massage therapists and facial estheticians, a staff enjoying years of experience at the Stillwaters Spa, each of whom will customize the perfect treatment and therapy designed for your specific needs. 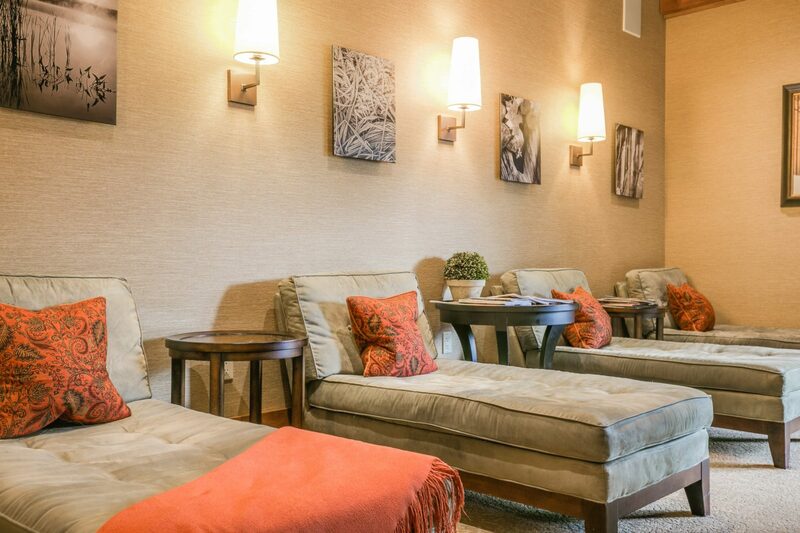 Pre or post treatment, clients of the Stillwaters Spa & Salon enjoy time in the Zen Relaxation Room, a tranquil, warm and cozy environment in which to read a book, visit with friends or simply relish some quiet time. When the weather turns cool, an inviting fire crackles in the fireplace. Another popular attraction at the Spa is the well-equipped locker/changing room equipped with a wet steam room. Our male clients enjoy the same accommodations in their private area of the spa and all enjoy a hot soak in the two outdoor hot tubs, just steps from the Relaxation Room. 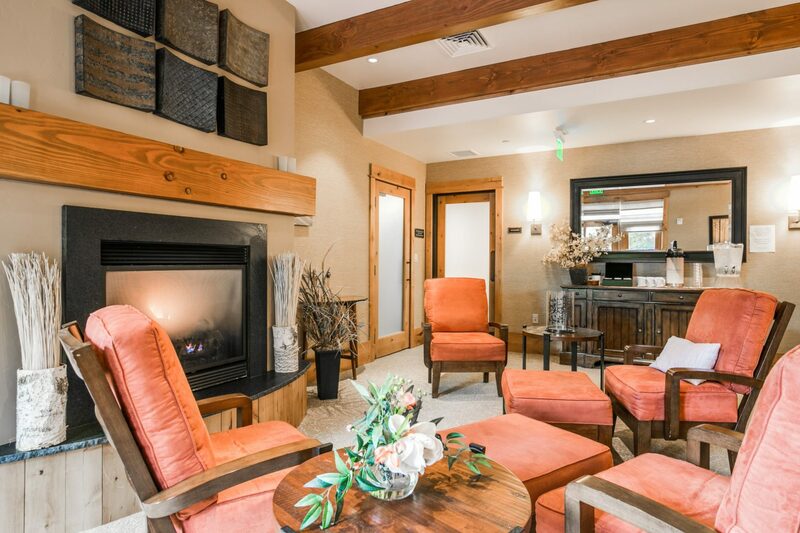 Whether you simply need to decompress from your daily hectic life, or need a tune-up sports message to ready for that strenuous hike or a day of golf on the Headwaters course, the spa is the optimum place to begin or end your day. Or, plan to spend the entire day! The Sage Café and Headwaters Grille are happy to deliver lunch, cocktails and specialty coffees and the like. The Spa also offers unique packages for groups, wedding parties and their guests, which can also include food & beverage options. The Stillwaters Spa & Salon. A perfect fit for any itinerary! Please arrive at least 15 minutes prior to your first appointment so that you will have plenty of time to check in and then relax in our Eucalyptus steam room or relaxation area. Arriving late may result in a shortened service. The full value of the treatment will be charged. For the comfort of our guests, the Spa is a non-smoking facility. We offer a spa menu of food and drinks to enjoy during your visit since outside food and beverages are not permitted. Guests must be at least 18 years old to have a private spa treatment. Teenaged persons are welcome when accompanied by an adult. Rescheduling or canceling your appointment less than 12 hours prior to your scheduled service will result in a charge of 100% of the treatment price. Ideal for gift giving, gift cards are available for any amount or corresponding with price of service(s). Included in every spa treatment are the highest quality products, featuring lines like Aveda, DoTERRA essential oils and Phytomer. If you have special requests, allergies, or questions about the products we use, please call us at 208.787.7250 before your appointment. Our Team of Specialists: Our therapists, stylists, and nail technicians are all licensed and have extensive levels of experience and education in their appropriate fields. Our core therapists have an average practice extending for 10+ years, with some having worked over 20 years in their fields. Teton Springs provides access to many of the West’s most enjoyable attractions, and is located 20 miles to the west of Jackson Hole. The south entrance to Yellowstone National Park is less than 40 miles to the northeast. Ski enthusiasts have easy access to either Grand Targhee Resort, known for its extraordinary powder skiing, or the Jackson Hole Mountain Resort and its breathtaking vertical descent. Both ski areas are less than 25 miles away. Indulge in the senses with this three-in-one body wrap using 100% natural whipped shea butters and aromatic botanicals. Skin is gently buffed, slathered with moisture rich shea butter, and gently wrapped in a warm herbal cocoon. Complemented with a warm stone foot massage, a cooling stone facial massage, and stress relieving neck work leaving you fully replenished. Reveal soft, smooth, and silky skin with our exquisite body exfoliation incorporating blends of grapefruit, orange, and tangerine oils. Our whipped shea butter and jojoba oil leave chapped skin feeling soft and supple. Nails are trimmed neat, cuticles tidied, skin softened, and moisturized. Perfect for those on the go and a great addition to any treatment. A condensed version of the performance manicure. A simple cuticle clean up and moisturizer finishing with a polish change. Perfect for those on the go and a great addition to any treatment. A condensed version of the performance pedicure. A simple cuticle clean up and moisturizer finishing with a polish change. Endulge yourself with these additions to your manicure or pedicure. Smooth local river stones are heated and used in combination with our penetrating oils to relax over worked muscles. This is a great treatment to raise your core temperature and eliminate toxins. Light to medium massage pressure is applied making this a perfect choice for those new to the spa experience. This massage provides gentle therapy to enhance overall well-being and to increase general circulation. Long a favorite among spa enthusiasts and athletes, deep tissue massage successfully releases chronic muscle tension. 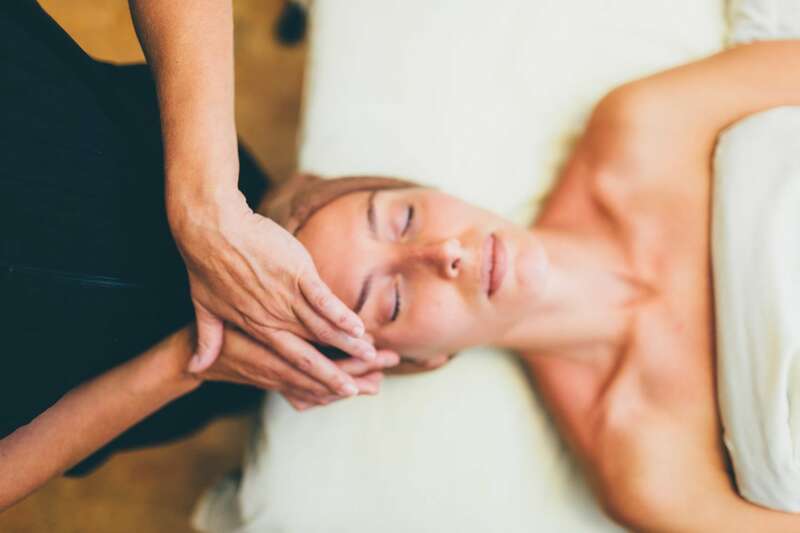 Utilizing slow strokes and more direct pressure, your therapist works deep into the tight muscles to alleviate stress and soothe muscle soreness. Specialized massage techniques provide gentle relief to tense muscles and aching joints while creating a synergy and increased energy levels. Available during the second and third trimester. Reflexology can help alleviate ailments throughout the body by simply working the points on the feet. A great treatment for someone that might have an acute injury, but also a great addition to any treatment. This treatment uses powerful, 100% natural ingredients derived from marine bio-technology which are scientifically proven to plump the skin and smooth wrinkles. This facial also includes an eye delight, re-plumping lip and self-heating mud treatments. This facial is unparalleled in its ability to increase cellular turnover and stimulate elastin and collagen production. Formulated for individual skin types, a triple masque treatment thermo-actively penetrates vital nutrients into the skin unveiling a revitalized and toned complexion. Get a fresh start! Those who are oily, congested, prone to breakout or acne will find balance with this therapeutic, yet relaxing facial. For 90 minutes the pore cleansing session includes a self-heating, detoxifying algae mask to assist the skin with purging impurities. This mini facial starts with a cleans and exfoliation then you receive a highly concentrated marine mask, selected especially for your skin type, targets the improvement of the skin’s functions, producing exceptional results.